Fall is once again in the air, and so is that chill that comes with it. Of course, you have been waiting for this very thing, and you are more than ready to get out there with your pumpkin spice latte and hit the walking trails around your home. Perhaps you are going to the library. Perhaps you are going downtown. Perhaps you are getting ready to meet with an old friend and you are eagerly making your way through the chill in the air and toward the warmth of wherever you are going. Of course, you love this weather, and you love the feeling of slipping on your jeans and socks then sweater and shoes. You know you love being out there in the cold, but you don’t want to sacrifice the comfort of how you feel to do it. You want to stay warm, and you want to look good doing it. That is where crochet arm warmers come into the picture. You know they are stylish, you know they are warm and cozy, and you know you want a pair for your very own. Or maybe two. Or three. Or more. But where are you going to get all of these warmers? How do you know you are going to like them all? Enter this book. In it you are going to find all of the things you need to know about arm warmers. You are going to learn how to make over a dozen different kinds for you to fall in love with, and you are going to learn how to make them your own. Imagine your very own line of custom arm warmers… sounds nice, doesn’t it? Love each style and make it your own… and more! 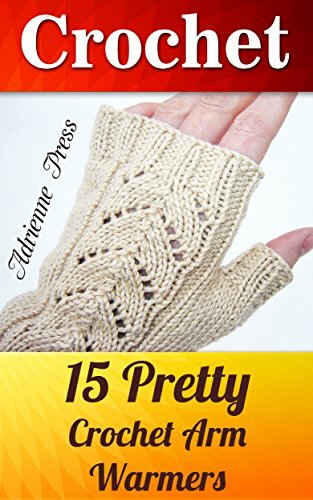 Download your E book "Crochet: 15 Pretty Crochet Arm Warmers" by scrolling up and clicking "Buy Now with 1-Click" button!